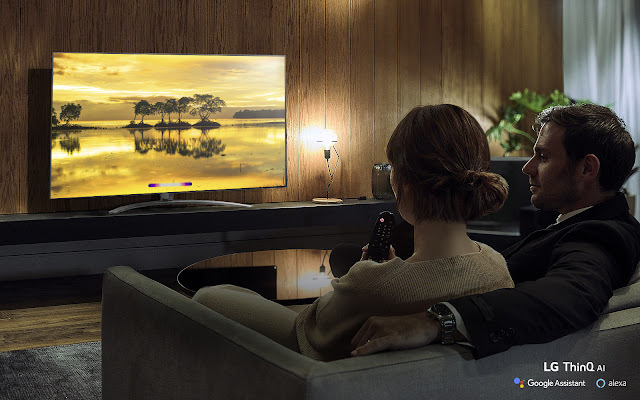 LG Electronics USA officially announced the launch of its premium 2019 LG NanoCell LED 4K Ultra HD TVs with AI ThinQ® beginning with the April debut of the 55-inch and 65-inch class LG Nano 9 series (SM9500 and SM9000 models), and the 49-inch, 55-inch, 65-inch and 75-inch LG Nano 8 series (SM8670 and SM8600 models) at LG-authorized dealers nationwide. Additional models and screen sizes will follow in May and June with other LG OLED models announced later in the year. LG's U.S. 2019 NanoCell TV lineup comprises 11 AI-enabled models, available in sizes ranging from 49 to 86 inches.1 Unveiled at CES® 2019, these new TVs leverage the power of LG NanoCell technology IPS panels and a new processor2 to deliver impressive picture enhancements, color accuracy and wide viewing angles to LED-backlit LCD TVs. Featuring LG's new α7 Gen 2 intelligent processor2, LG NanoCell TVs offer AI-enhanced picture and sound, powered by a deep learning algorithm. 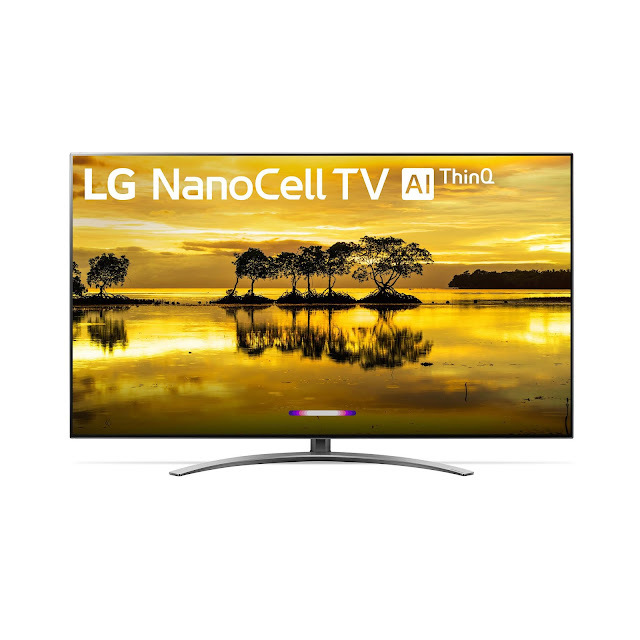 LG NanoCell TV Nano 9 Series models feature Full Array Local Dimming (Full Array Local Dimming Pro in the 9500 model) while Nano 8 Series models use Local Dimming. All 2019 LG NanoCell TVs will support Apple AirPlay 2 and Apple HomeKit for easy streaming of video and audio content and connectivity to Apple's smart home products. LG NanoCell TVs will also feature Amazon Alexa support to complement the Google Assistant which is already built-in, making LG the only TV brand to provide support for both leading voice assistant platforms without the need for additional hardware.3 All 2019 LG NanoCell TVs include the LG Magic Remote which enables you to access both voice assistant platforms and control compatible smart home devices using just your voice. LG Nano Cell TVs have the new α7 Gen 2 intelligent processor (except the SM8100 series) which uses deep learning technology to optimize the picture. AI is also utilized to enhance sound, enabling the set to provide a virtual 5.1 channel up-mix from 2-channel stereo sound. These series also support HDR10, HLG and Dolby Vision for an enhanced viewing experience. "Our 2019 Nano Cell TVs promise to once again be the best performing premium LCD sets on the market," said Tim Alessi, head of home entertainment product marketing at LG Electronics USA. "Our proprietary NanoCell and IPS technology combine with the convenience of our AI ThinQ technology to provide a powerful combination of picture quality, ease of use and are also available in some of the ultra-large screen sizes consumers want today." LG continues to incorporate cutting-edge artificial intelligence to all 2019 LG NanoCell TVs with LG ThinQ AI combining LG's award-winning webOS smart platform to bring new levels of convenience and control to the consumer. This enables 2019 LG TVs to create an intuitive AI experience that uses voice commands to control TV functions and seamlessly perform functions to discover and play content, control TV settings, manage schedules, access information and control compatible connected smart home devices such as lighting and home appliances. Through the inclusion of HDMI 2.1 ports, select LG NanoCell TVs will support advanced features such as high frame rate (HFR), variable refresh rate and enhanced audio return channel.